This week at Just Add Ink its a colour combo I came up with ..and I had trouble with it lol. 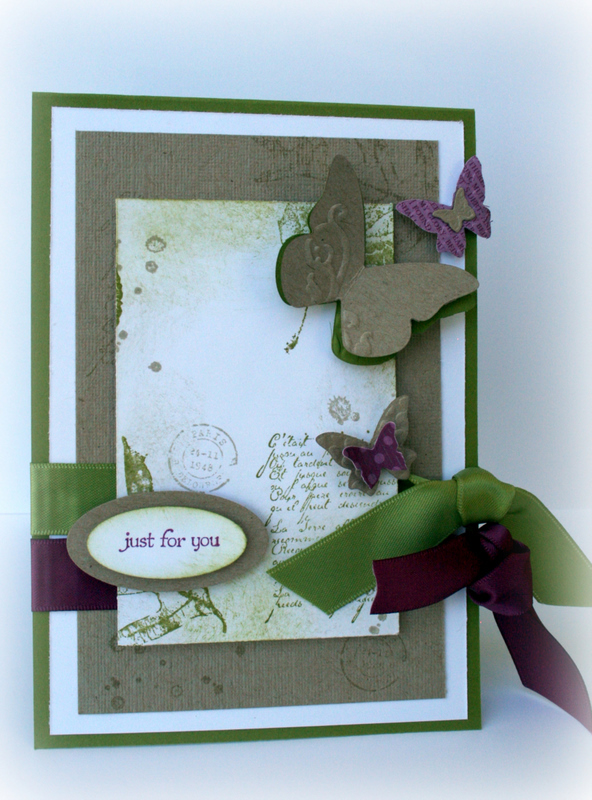 and heres what I came up with using a new stamp set out of the upcoming new Autumn/Winter mini catalogue. This set is called French Foliage. Its one I almost overlooked in pre ordering but Im so glad I did order it now! Thanks to JAI DT member, Mae Collins who has done our colour combo buttons. Check out what the other DT girls have done here...and Nikki is playing along this week for the first time as our new Design Team Member. Yay! My favourite colour combo. This was a stamp set that I had to have and haven’t used it too much-I like the fresh green grass feel to the card. Love, love, love it Delys! The more I look at that stamp set, the more likely it is I will get it too. Thanks for the inspiration, as always!! I always use that colour combo…as its all i have!!! A great card and as usual you always make stamp set that doesn’t inspire me to be one that I have to think twice about! Love all the “bits and pieces” in this card – beautiful. And I love your new blog-look – I obviously haven’t stopped in a while cos its the first time I’ve seen it! Very professional looking! A fantastic card Delys, I love all the elements, they go perfectly together – love love it. And I am lovin’ your new blog look too – very funky! I just love the vintage feel of this card and the gorgeous double ribbon treatment!! Love the new look to your blog! Love how you have used this set Delys, l have added it to my wish list now, between you and Melissa Davies, l,m sold.